When Bhutan set out on its democracy experiment in 2008, I must admit to a little skepticism. I thought the Dragon Kingdom would follow in the footsteps of Nepal’s Panchayat democracy (initiated by King Mahendra in 1962). In this party-less “guided” democratic system the people could elect their representatives for a tame parliament, while real power remained firmly in the hands of the throne. But then to my surprise the Bhutanese monarchy took the radical step of allowing, even insisting on the formation of actual political parties. To free-up the traditional feudal mindset of the Bhutanese public, the very popular king took the decision to abdicate and appointed his young son to the role of a low-profile constitutional monarch. Shortly thereafter a number of independent parties sprang up in Bhutan, but through mergers and disqualifications, two parties finally remained to contest the elections: the People’s Democratic Party, PDP (མི་སེར་དམངས་གཙོའི་ཚོགས་པ་) and the Bhutan Peace and Prosperity Party, DPT (འབྲུག་ཕུན་སུམ་ཚོགས་པ). The latter won the elections overwhelmingly though it was explained by some “analysts” that its victory had resulted from it being the more pro-monarchist of the two parties. But two months ago, in Bhutan’s second national elections the weak opposition People’s Democratic Party (PDP) stormed into power, winning 32 of the country’s 47 parliamentary seats. Voter turnout was an impressive 80% of the country. Bhutan has proven that it is a real democracy, and a vibrant and dynamic one as well. The PDP not only defeated the “royalist” DPT party but did so while rejecting Bhutan’s official doctrine of “Gross National Happiness” or GNH. Earlier, such a repudiation of Bhutan’s core national policy promoted by His Majesty Jigme Singe Wangchuk in 1972, would definitely have been regarded as lèse majesté, perhaps even sacrilegious. 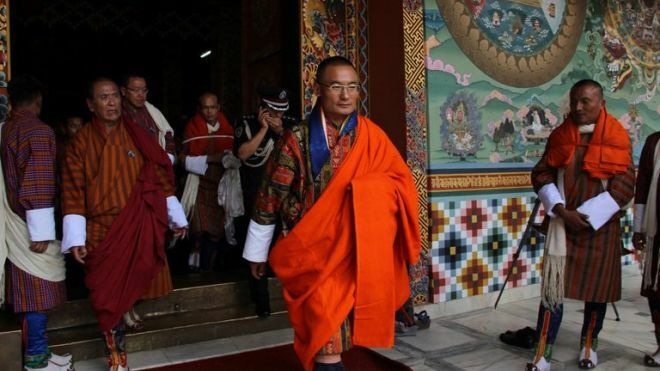 In an interview with AFP, the new Prime Minister, Lonchen* Tshering Tobgay was critical of GNH: “I’m sceptical on how it has been overused by some people and how they have been distracted from the real business at hand,” While campaigning for the election, often on foot through remote villages, Tobgay focused on what he sees as “the business at hand” for Bhutan: chronic unemployment, poverty, corruption and a sense that politicians were too remote. The Lonchen was recently in New York for the UN conference and in a lengthy interview with the New York Times he repeated his criticisms. Back home in Bhutan life went on as usual. The sky didn’t fall. The ground didn’t crack open and swallow up the kingdom. The royal family continued to maintain its dignified silence. Constitutionally, I am told that members of Bhutan’s royal family do not even have the vote, since the act of casting one would indicate royal support for a particular party, which could affect the fairness of elections. There is a regrettable and absolutely unwarranted prejudice among older Tibetans (which the younger generation happily don’t seem to share) to look down on the Bhutanese as somewhat primitive and unsophisticated. So perhaps a comparison of the relative progress of our two political systems might be in order, if for nothing else than to try and guess which one appears to be more the creation of enlightened democrats and which one the work of superstitious barbarians (lalo). In Dharamshala this September, shortly after celebrating “Tibetan Democracy Day”, the Parliament-in-Exile initiated what can perhaps be called Cultural Revolution style “struggles” (thamzing) against those who had “hurt the feelings” of His Holiness the Dalai Lama. 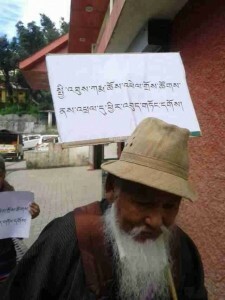 The campaign was kicked off with the censuring of a Member of Parliament, Karma Chophel, on the crackpot charge of “speculating that, when composing the “Words of Truth Prayer”, His Holiness the Dalai Lama had “independence in his heart.” (A detailed report is available at Tibetan Political Review.) This bizarre accusation brought to mind a Cultural Revolution incident where a down-to-earth Chinese farmer speculated (perhaps a little to loudly) that sticking Mao Zedong’s quotations in the fields to encourage vegetables to grow, was perhaps not an effective agricultural technique. He was denounced, struggled, and beaten – possibly to death. Led by the speaker, Penpa Tsering, our Members of Parliament then proceeded to launch fierce denunciations of other Tibetans (including myself) who had simply spoken up (often forcefully but never disrespectfully) in favor of independence over the Dalai Lama’s “Middle Way” policy. Our hur-tsunpa (Ch. jiji fenzi 积极分子) MP’s demanded that these malefactors not only be exposed but banished from exile society, not withstanding the fact that the exile parliament does not have any legal powers to do anything of the kind. But of course the real but unstated intention was to instigate the more fanatical and uneducated elements members of exile public to take matters into into their own hand, which in the past has resulted in a number of mob attacks and public humiliation of establishment critics. Even the murder of one. If our hon’ble speaker had deliberately set out to sabotage the Tibetan issue in India, he couldn’t have done a better job than with this one interview. The MPs were allowed unlimited time by the speaker and each one tried to outdo the others in the ferocity of their denunciations, one of the more rabid being the North American representative, Norbu Tsering, who declared, “We have to get rid of these people like we get rid of rotten teeth when they start aching.” With so many MPs essentially repeating themselves, some aspired to originality by denouncing the editors of the Tibetan Political Review, the only serious political journal in the Tibetan world, and even the filmmaker Tenzin Sonam for his documentary film, Sun Behind the Clouds, which received the 2010 Vaclav Havel Freedom Award from president Havel himself. The film also received a number of other Human Rights awards including the prestigious Rudolph Vrba “Right to Know” Award. But when it seemed that this parliamentary exercise to crush free speech and free thought in Tibetan society had picked up a nice head of steam, something quite unexpected happened. 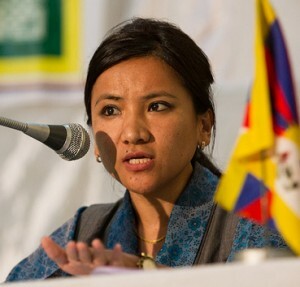 A young MP, Dhardon Sharling, rose from her seat and calmly declared that instead of heaping blame on a few individual Tibetans, everyone in the Parliament ought to look into their own “conscience” (she used the English word) for not doing enough to realize His Holiness’s wishes. Dhardon la’s statement is on youtube. Another MP Chungdak Koren, who could not attend this parliamentary session asked a colleague to read her questions and opinions to the Parliament. Chundak la also posted them on her own blog. An excerpt: “… instead of excluding critics, we should be including them and inviting them to air and exchange views. These people might have constructive suggestions and their inputs could be of great value. We always need to retain an open mind when it comes to criticism“. A few other MPs, I am informed, did not join the thamzing denunciations. Unlike the old days when the establishment could whip up large mobs of hundred or so thugs and fanatics to beat up and intimidate critics this time around the Parliament only managed to round up a small rent-a-crowd of old polas and molas who shuffled around Gangchen Kyishong carrying identical signs, almost certainly printed of a wide-format printer from a CTA office. Even the efforts made to spread the campaign throughout Tibetan communities worldwide does not seem to have met with much success. I heard that a community meeting was held in Switzerland to denounce those who had “hurt the feeling of Kundun”, but other than that there has been no report of any such confab. In New York City an attempt was made to stop a public talk (The Rangzen Imperative) that the Tibetan National Congress (TNC) had arranged for me to give to the Tibetan public on the 5th of October. 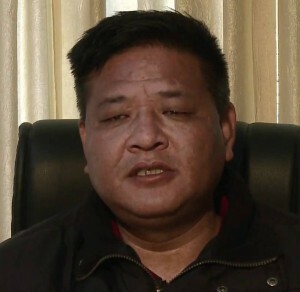 The manager of the United Sherpa Association, whose hall the TNC had rented for the occasion, received anonymous phone calls claiming that the TNC and myself were against the Dalai Lama. Another phone call accused the Sherpa Association of renting its hall to Shugden worshippers. Threats of a public demonstration and disruption of the lecture were made, but on the actual morning of the talk no protester showed up. Inside the auditorium there was standing room only. TNC volunteers also streamed the talk on Livestream and have received, up to now, over sixteen thousand five hundred viewers from all over the world, even from Tibet and China. 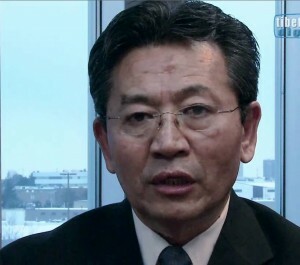 In a welcome departure from the usual timidity and self-censorship of the Tibetan media, the exile-parliament’s conduct was vigorously condemned in a local Tibetan language newspaper Bod Kyi Bangchen (Tibet Express). The opinion piece by the deputy editor, Choenyi Woser, was also translated in English and appeared in the Tibet Sun. Chonyi Woeser la was also the first to make the comparison of the exile parliament’s antics with the Cultural Revolution. Another article in English, I Solemnly Swear by the Flag of Tibet by Tenpa Gashi, not only ridiculed the antics of our legislators with biting wit and satire, but also offered a well thought-out solution to this problem. Tenpa la is the son of the late Gashi Tsering Dorje, a leading political commentator from the 70s and 80s and a friend of mine. Back in those days he and I wrote articles exposing the limits of Deng’s Liberalization policy and the naïveté of Dharamshala’s hopes for negotiations with Beijing. Tse Dorje la’s writings had a greater impact on Tibetan public thinking than my pieces in the Tibetan Review, as he wrote in Tibetan and furthermore had a profound understanding of the Chinese Communist Party and its long history of duplicity and cruelty. So in spite of our exile-parliamentarians diligently emulating the sycophancy of North Korean legislators (of the Supreme People’s Assembly) we now have a novel and welcome development where Tibetan journalists, bloggers, Rangzen activists, even a few MPs and an growing number of skeptical and concerned mimang are openly asking hard questions about those who claim to represent them. So perhaps all is not lost for Tibetan democracy, though it does appear to be touch and go right now. But how did our politics degenerate to this disgusting septic-tank low in the first place? I am not going to go into details on the history of our so-called democracy. I have already written a number of essays on that subject, and those needing a full picture might want to check out my three-part “Waiting For Mangtso” on this blog-site. What I would like to do in the next essay is uncover the more immediate causes of this September’s mini Cultural Revolution in Dharamshala, and the earlier undermining and enfeebling of the Tibetan Youth Congress and the Gu-Chu-Sum Association of Former Political Prisoners. I believe all these events are interconnected and point to an underlying scheme to weaken, even terminate the Tibetan struggle. I will also lay out a simple course of action that all Tibetans can take to save our democracy and make the exile-parliament and administration answerable to the exile public and heedful of the desire of those in Tibet for an end to Chinese rule. * “Lonchen” was the traditional term used in Tibet for prime-minister. The term “Si-lon” was adopted in 1926 when Langdun Kunga Wangchuk became prime-minister. Samdong Rimpoche started the trend of Tibetan prime-ministers creating ever more grandiose titles for themselves, e .g. kalon-tripa , sikyong.